Halloween week has been very busy! (And it's not over yet!) We went to the zoo for their Halloween "Spooktacular" where Emily gave cotton candy another try and decided that she does in fact, love it (she had it at the shore this summer and hated it). And, she won 3rd place in the costume contest, which was an experience*. 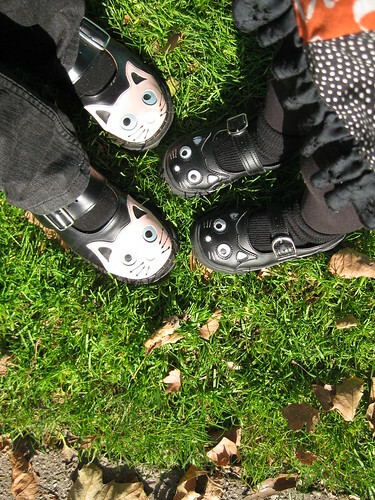 I dug out her TUK knockoff kitty shoes that match my Tredairs and discovered that the size marked on them was wrong -- if I'd waited to pull them out she'd have never worn them! So, whew. And she loves them! I made this Insa to see what it would look like without the overskirt, just as a basic skirt, and I was very pleased. 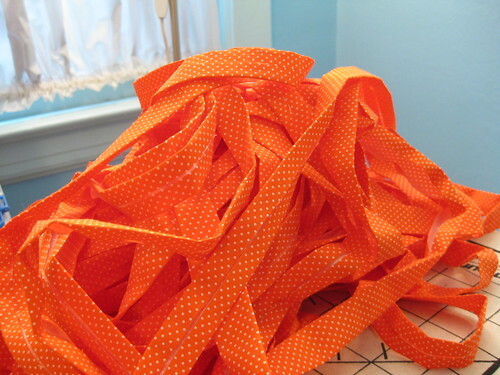 I also was experimenting with some bias tape used as trim rather than ribbon. It even has some little bows at the back, which were much harder to make from bias tape than from ribbon! Here's a closeup of the bows. I don't love them, but like I said, it was largely an experiment so I'm not going to worry about it. Much! The body is a very soft cotton baby rib, the sleeves a blend of some sort I picked up a while back. Unfortunately, while the stripes are cool, the fabric is already pilling from the synthetic content it must have. Also unfortunately, I kind of hacked out the applique because I just wanted to be done. But, it fits great and is very comfortable. 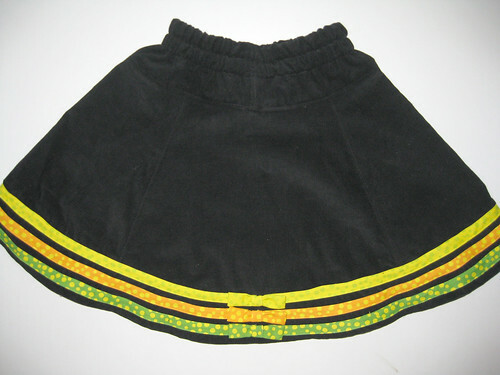 More Zoelas for me are on my sewing list already!! 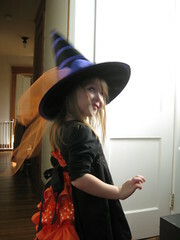 Maybe even one in velour like Emily's Halloween Zoe! And now, it's time to get some lunch into a hyper Halloween witch so she has the energy to get through several events today!! Happy Halloween, everybody!! *To make a very long story not-quite-so-long, I misunderstood the contest and thought it was more of the little kid costume parade type thing I am used to -- no, it was actually a 3-winners-only highly competitive display of bad parenting. A small group of mothers climbed onto the stage and blocked several kids from the judge's view, including Emily -- but the MC called the kids up anyway. Then, these same mothers booed when the last winner -- Emily -- was announced, as none of their kids won. Booed!! All these kids were under 5! I was horrified at their behavior, not to mention the lessons they were teaching their kids, but luckily Emily was oblivious to it and was excited to win when she had misunderstood the contest to be just going up to the judges to see what they thought of your costume. This week's This Is... theme brought to you by Victoria of Earl and Cookie. Do you think I might have a little too much single-fold binding there? Considering I just need to edge a tablecloth? Note the finished tablecloth underneath the apparently untouched mound of binding. 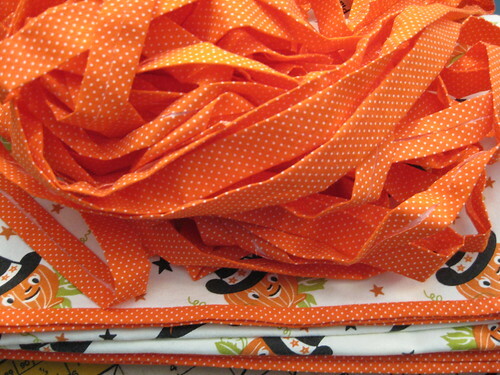 I'll be making Halloween-themed linens for the next decade. 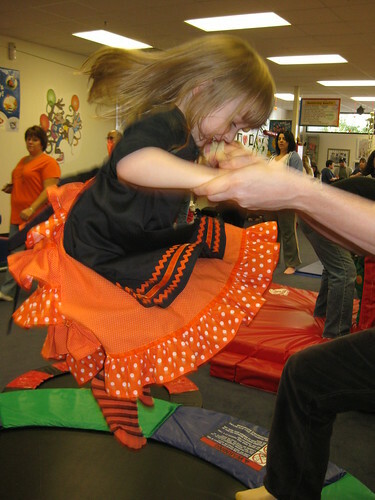 That is not actually her complete outfit -- she is dressed up here for the Halloween party at her playgym (to which I wore this) I am making a heavy top for outdoor events, but I knew it would be a bit warm at the gym so I just put a black tee underneath. There's also a broom and a black cat around here somewhere....I should get complete outfit photos this weekend! The twirl on this dress is amazing. 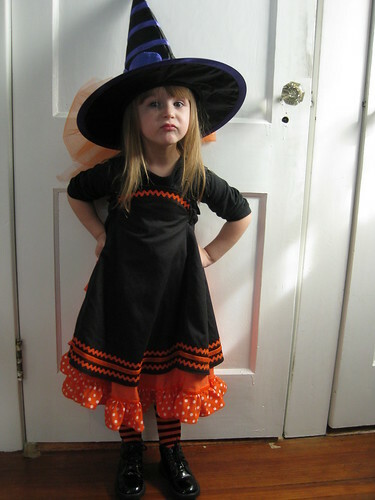 Emily is seriously enamored of it -- she insisted on wearing the dress right up until bedtime. 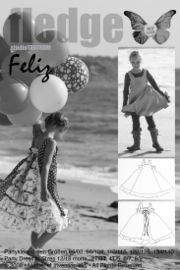 So, I think there will be more Felizes in our future, whether or not we need any party dresses! The only things I would do differently: I would cut the overskirt longer and check the length before hemming, after assembly. I also might think about adding facings to the sides of the underdress, while it would make the dress even heavier there, I didn't like the wrong side of the fabric showing at the sides. Not a big deal, and if it wasn't all on black I probably wouldn't even notice. I also might make the whole thing a bit shorter since it will end up in the garden...but for now, we're just enjoying this witchy Feliz! Emily isn't feeling well today, so I turned to the random number generator for help in giving away all three sets of patterns I have this week. (Not as much fun as using Emily, but certainly much faster!!) The results? Come on down!! Send me your addresses and I'll get these out asap! Thanks again to everyone who entered, and keep your eyes on the wiki (and here) -- there will be another giveaway in the not-too-distant future! 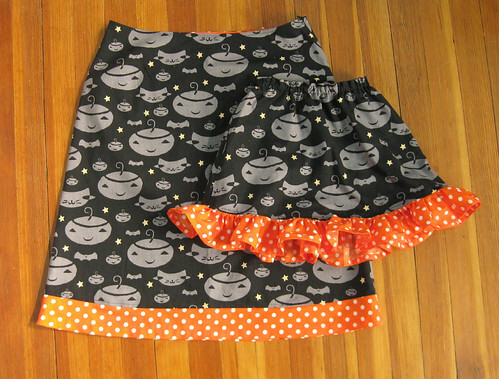 Matching halloween skirts for me and Emily! 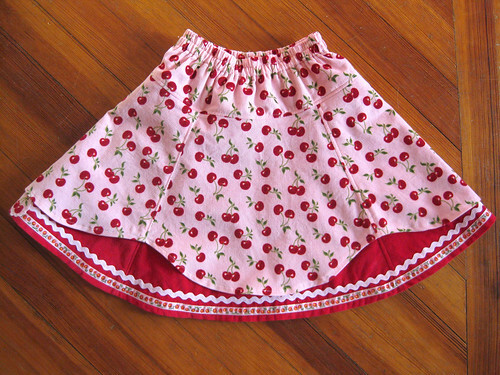 Both skirts are made using the Rømø pattern I've used before. The base fabric is a "Spooky Hollow for Joann's" cotton I bought years ago and stashed when it went on sale - I've waited all this time for a good reason to use it! Finally! 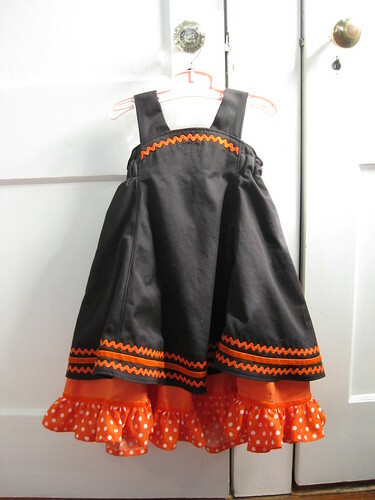 The orange dotted fabric was left over from making Emily's Halloween costume dress (in fact, the ruffle on her skirt was actually made for her dress, I had a big length of ruffle left over and she asked me to put it on her skirt). 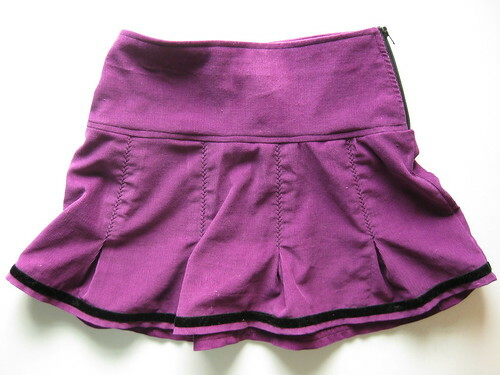 Here's my skirt alone, and Emily's. Honestly, I think this is my favorite skirt pattern, so simple to put together (both versions) and also so easy to dress up. I just did a facing this time on mine (instead of a full lining) since I will probably not wear it as much, which made it come together even quicker. The girl's version is so easy I'd make Emily 10 of them....if I didn't suspect she is planning to boycott skirts now (as well as pants and sleeves). It's called Knut, after the famous polar bear, obviously. So cute!! I think it will be used for a copy of a favored dress Emily is on the verge of growing out of. I will almost hate cutting into it!! I also got the corduroy you can see in this photo, Emily picked that one out from the choices I gave her. NO idea what that's going to be. It's so adorable. I should also note that Bunte Fabrics is having a great sale right now on Japanese canvas fabric as well as lots of other stuff -- if I hadn't already known what I wanted it might have taken me forever to decide what to get! It's time for our last and final giveaway to celebrate the launch of the farbenwiki! Again, I've got a pair of patterns (courtesy of Nancy Langdon of StudioTantrum/Fledge) -- an Anna and a Feliz. (These are 'scratch and dent" patterns that had folding issues; so they come without the usual ribbon tags and have their titles crossed out to prevent their sale, just so you know. 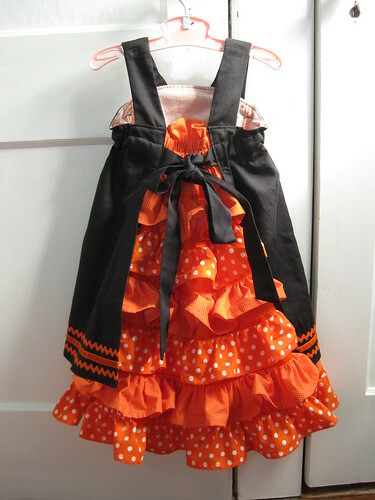 But they are perfectly usable and will make fabulous dresses!) All you have to do is comment on this entry or email me (and mention the giveaway!) by Monday morning -- and it looks like i may even an extra set or two to give away, so your chances may be even better than usual! Thanks for coming by! Please note -- if you enter, plan on coming back here on Monday to see if you've won just in case my email to you gets filtered. If I don't hear back from the winner within 48 hours of emailing I will draw a new name and pass the patterns on. Thanks! Plus, here's a shot of it on the dressform, as the weather has gotten warm again and there's no chance of getting it onto Emily anytime soon. (Also note the completely inconsistent light we have this time of year -- every room a different color.) I ended up almost trimming it identically -- I brought home a very similar green ribbon along with my pink rick rack! 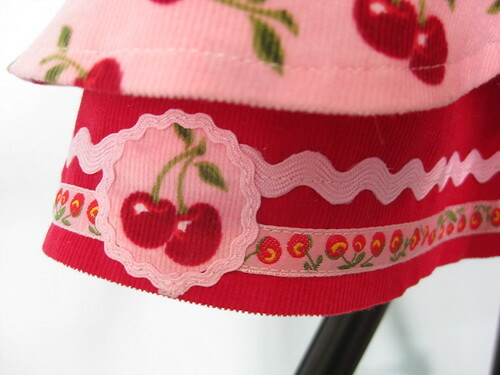 But the ribbon didn't wash well so I waited, and then I found that perfect jacquard cherry mini-ribbon. I did not copy the trim on the yoke seam from Sara (she said it is always covered up anyway), and I also added a little medallion that I made from scraps. So, it's not a perfect clone...but it sure is close! Luckily we're continents apart, so no chance of an embarrassing playground faux pas. The pattern went together incredibly well -- it is a bit long, and definitely too long for a girl who plays in the dirt in her skirts and dresses, so I shortened the yoke quite a bit, and truthfully, I'm happier with the proportions this way. 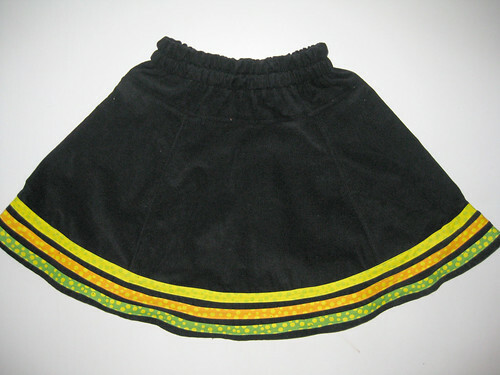 The resulting skirt is really nice, full without much bulk. We like it so much there's a second one underway already! So here's the macaroni recipe I use (as seen in the polka dot macaroni). It's based on the (allegedly) original recipe from the Automats, but there is actually controversy about that recipe -- some people claim there are tomatoes, others say no. Relatives who ate at the automat say no. But who knows? I don't really care. 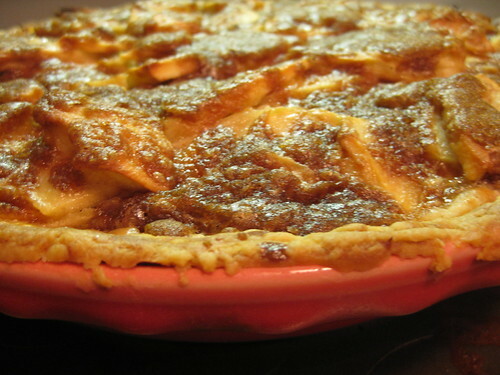 I love it because it's so easy to remember: 1/2 t worcestershire, 2T butter, 2T flour, 4 oz pasta, 8 oz cheese, 12 oz milk. It's like mathematical macaroni! 4. melt 2 T butter in a small saucepan, add 2 T flour and whisk until it just starts to turn golden brown. Grind in some pepper if you like. 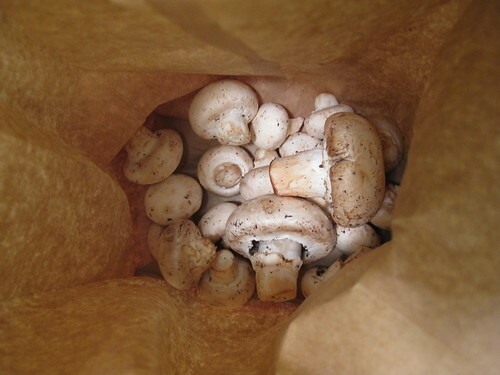 Add 12 oz of milk and cook on medium low for 5-6 minutes (don't let it boil! ), stirring regularly. Hey, you just made béchamel sauce!! Awesome! 5. combine sauce, pasta, cheese and 1/2 t of worcestershire sauce in a bowl and stir until just combined. 6. Scrape into a baking dish (I use a 9 x 12 glass dish) and bake for 30 minutes. Or so. Depending on your oven. Dish it up! Also, this is best fresh, but it can be frozen and reheated - Emily loves this so much I often bake a whole one just to portion up and freeze to give her later. She even likes it at room temp, I don't know if I like it that much though! Congrats on winning giveaway #3, Rebecca! And thanks to everyone else who entered -- remember to come back next Friday for the final giveaway, there's one last set of patterns waiting to go to a new home! Rendering Fashion, Fabric and Prints with Adobe Photoshop: I waited to get this from the NYC library for months, literally...and what a disappointment. It's a textbook, and feels like the worst of the bloated textbooks I had to buy in college. The photoshop advice is really bad, and I feel like the textile advice can't be much better. The sections on how to swipe material had me a little disturbed as well. I didn't actually finish it and I'm not going to. If you've been trying to find this book for your Spoonflower designs, just go get a good Photoshop book instead. The Algebraist: Another book I am probably not finishing, at least not now. I am a big Iain Banks fan (well, really an Iain M. Banks fan) but I'm having trouble getting through this one for some reason. I have to admit, I didn't love the last two books of his I read either. Mothstorm: The Horror from Beyond Uranus Georgium Sidus! : Now here is a writer who has yet to disappoint. I loved the Mortal Engine series, like LOVED; and I am really enjoying this new series as well. 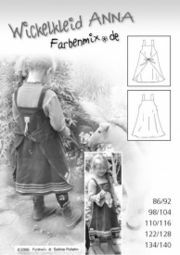 The Art of Manipulating Fabric: Fantastic resourse for anyone who sews -- I just got this but I already know it'll be one of my most used references. It's truly amazing, you can check out this google books preview to see what I'm talking about. The section on ruffles and flounces alone is worth the price of admission. There are also several books I am in the middle of which had to go back to the library before I could finish; the Splendid Table most notably. That is a cookbook that is going on my wishlist. A stack of magazines in the kitchen I need to riffle through and toss. And surely, more books stashed here and there that I am not remembering. I used to knock books off so fast, but with the preschooler at my heels....it takes me forever now. Having my booktime slashed drastically has had one good effect though -- I don't bother finishing books I don't really like! Now that is a timesaver! This week's This Is... theme brought to you by MissK of My Champagne Dreams. 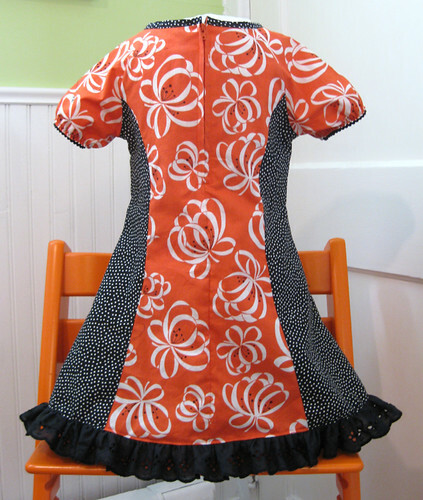 friday freebie -- pattern giveaway 3!! It's time for giveaway number THREE to celebrate the launch of the farbenwiki! Once again, I've got a pair of patterns (courtesy of Nancy Langdon of StudioTantrum/Fledge) -- an Anna and a Feliz. These are 'scratch and dent" patterns that had folding issues; so they come without the usual ribbon tags and have their titles crossed out to prevent their sale, just so you know. But they are perfectly usable and will make fabulous dresses! All you have to do is comment on this entry or email me (and mention the giveaway!) by Monday morning -- and if you don't win, there will be one last chance next weekend!! And please spread the word...so we can spread the love! And Rebecca is this week's winner! Please come back next Friday for the last set of patterns! Thanks! Another project has been marked off my Fall sewing list! 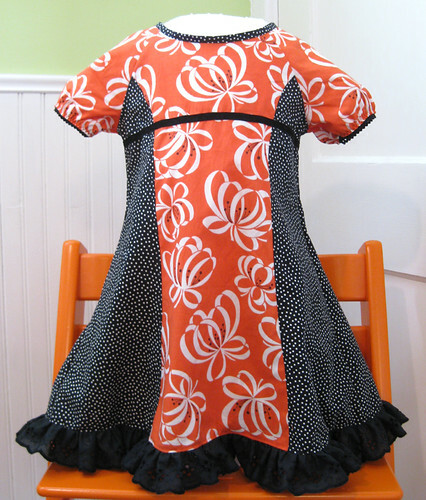 This is the farbenmix Roxy tunic/dress pattern, made with some really cute "Katie Jump Rope" Denise Schmidt fabric I got last Xmas (thanks, Hallie! ), which I have been itching to use. 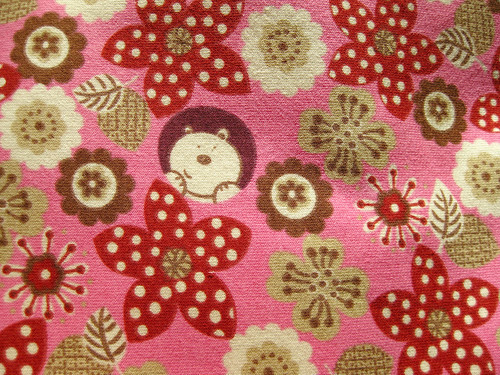 It's paired with a dot fabric from Quilt Gate I bought a ton of early this year (it went out of print, but I love it as an accent or trim so I stocked up). Unfortunately, I couldn't get an invisible zipper in the orange, so I used a regular one, and I really am not thrilled with that. But, it's not like Emily cares! Well, whoops. It's been some week. I was supposed to post this on Sunday, and I even had my post planned, but I never got to it. So I'll just give you the gist: this was a rough one! I love everything in my kitchen, I swear. First I ruled out all gadgets since a "tool", to me, is a non-powered item. And I finally decided that my one cannot-live-without item is my wusthof santoku knife. Honestly, I love it so much more than my chef's knife. I use it for practically everything. You can't beat it on vegetables! Although...I doubt it cuts bread too well...so don't ask me to give up the rest of my knives! This week's This Is... theme brought to you by Sharon of Handmaiden. Send me your address, Nicole! And everyone else, please come back this Friday to enter giveaway #3 -- I have 2 more Feliz/Anna packs to give away! And please...pass the word, and visit the farbenwiki! I keep forgetting to post this, we have a bunch of stuff on ebay right now. There is a handful of my knitting stuff, some kits, vintage magazines and a big batch of vintage needles. Also, I've gotten a lot of questions about the bread, and while every household and machine are going to call for a different recipe, one constant is high quality ingredients. For bread I use only King Arthur flour -- when they had to raise prices this year we tried cheaper brands and there was a noticeable difference in taste. I'm sure any comparable flour would be fine. Also, when dry milk is called for in baking, the dry milk from the grocery store is not really what they're talking about, you need to get baker's dry milk, it's a totally different thing. I know it's tempting to use the cheapest stuff available but it will make a huge difference in your bread if you use the good stuff. Also, get some ascorbic acid (from any baking/spice place) and add 1/8 of a teaspoon to your bread mix, it makes the bread a lot softer and acts as a preservative. Not that we really need that around here. Finally, I use instant yeast, it works great, and cuts baking time in half. Seriously. I cannot deal with a 4-hour loaf of bread! It's time for giveaway number TWO to celebrate the launch of the farbenwiki! Once again, I've got a pair of patterns (courtesy of Nancy Langdon of StudioTantrum/Fledge) -- an Anna and a Feliz, which is just about all you need to dress any girl from toddler to, okay, not teen, but big girl, definitely. These are 'scratch and dent" patterns that had folding issues; so they come without the usual ribbon tags and have their titles crossed out to prevent their sale, just so you know. 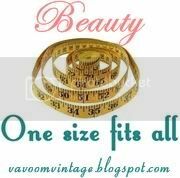 But they are perfectly usable and will make fabulous dresses! All you have to do is comment on this entry or email me (and mention the giveaway!) by Monday morning -- and if you don't win, try again next weekend!! And please spread the word so we can spread the love! And Nicole is the winner! Please come back Friday Oct 10th and enter giveaway #3 for another chance!! 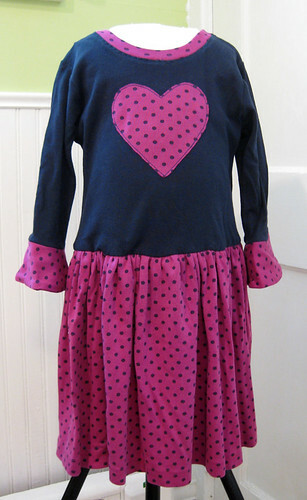 Henrika pattern from Farbenmix, made from some navy cotton rib and a recycled Hanna Andersson playdress (the dotted purple stuff). 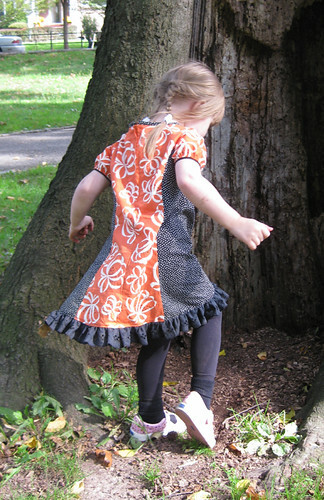 The skirt is really the original playdress skirt grafted on to the Henrika top. I think it came out really cute, but Emily has declared war on all sleeves, so it may be a while before I get her into it. I had very little trouble with the pattern; the sleeves I chose are long by design but I shortened them a tad anyway.